The international reunion marking the 150th year since the founding of British India Steam Navigation Company will be held in Sri Lanka at the Mt Lavinia Resort (pictured), south of Colombo. The Reunion will be held in the first week in May 2006, commencing with flights on April 30. Mt Lavinia can cater for our numbers and the functions, and the accommodation costs are less than most resorts. 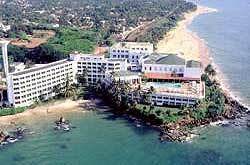 There is also the Palm Beach Hotel nearby, which will work with Mt Lavinia Hotel. Galle Face Hotel closer to Colombo, about 15 minutes from Mount Lavinia Hotel in a taxi, is also available. The package price for the venue which includes return flights, taxes, transfers to and from the hotel and a hospitality desk, bed and breakfast, the barbeque, the 150th BI anniversary dinner and the Sunday curry luncheon. UK flights will be London Heathrow direct to Colombo with Sri Lankan Airlines, or from Glasgow, Birmingham, Manchester, London Heathrow and London Gatwick via Dubai with Emirates Air. Additional meals at the hotels will cost approx: Lunch US$11.50 (approx £6.50) Dinner US$12.50 (approx £7.00). By allowing seven days for the reunion, the organisers hope everyone will plenty of opportunities for sightseeing, including visiting Kandy and shopping in Colombo, and maybe even have a Planters Punch in the GOH in the centre of Colombo. If you expect to attaned the reunion and have not yet paid the registration fee, please download a registration form here. Print the form, complete and send to the appropriate representative. Booking instructions will be forwarded on receipt of the registration Form with the £15 registration fee. Additional meals at the hotel will cost approximately: Lunch NZ$18 (AU$16) Dinner NZ$20 (AU$18). Flights range from $1,700 to $2,000 depending on departure airport. Please note there could be some variation if currency exchange rates change significantly between now and making the final payments. Sunday May 7 - Curry Lunch - mainly chicken, but various meat and vegetarian curry dishes (with all the condiments), and non-curry and vegetarian dishes for those who prefer them, in fact something for every taste. Monday May 8 - departure.  The organisers have tentatively booked 150 rooms at the Mount Lavinia Hotel. Two thirds have now been allocated. All the events are being held on the hotel premises.  As there is only waiter service, the hotel is building four portable bars for our reunion, and these will be manned and located at the various events, with BI type wine chits in use.There will be a bar in the pool area, and two will be placed on the beach for the barbeque and fireworks display.  The main ballroom, is air conditioned, and will be kept open during the day for our exclusive use complete with a manned bar, for those that find the midday sun a bit warm. The hotel will be using the ballroom in the evenings, on two nights for us, and our Sunday Curry Lunch.  There will be a manned information desk in the foyer during the day.  BI reunion T-shirts and polo shirts can be purchased at the hotel.  Anyone interested in organising local interest groups (cadetships, school cruise ships etc) please get in contact: warwickharwood@aol.com At some stage an official photographer will be engaged to make a record of the various BI personnel groups by ship types, if considered appropriate. (Troopships / School Cruises / Passenger (Ds, Ss, Ks, M's, etc) / Cargo (Bs, Cs, Ps, Os, Is, Ns Ws, etc) / LSLs, LSTs / Tankers / and cadetships.  Informal group functions can be organised if required (these to be arranged closer to the time).  There will most probably be BI memorabilia or souvenirs for sale during the week, if sufficient can be obtained.  There will be a daytime manned information desk with a notice board at Mount Lavinia Hotel with duplicate notice boards in the other hotels, giving relevant details of forthcoming events and trips. Probably a display of BI memorabilia, BI photographs, BI News, and other items of interest, if sufficient can be obtained. The committee would be extremely happy to receive any BI items that you no longer require, to add to the collection. • A list of those who have indicated they might attend the reunion is available to download here. The UK Committee will deal with those residing everywhere except Australia and New Zealand.